In several traditional chapels today, there is the observance of the Vigil of All Saints for All Hallows Eve. This day was actually established to honor the many martyrs who gave their lives for Christ and His Church. Evolved through the centuries, this explains why this feast is taken from the Common of the Martyrs. The preparing by a solemn vigil for the celebration of All Saints’ Day, probably dates from the Eighth Century, when November 1st was fixed for the celebration of the feast. The fast on this vigil is of universal observance. As on other vigils Holy Mass is celebrated in purple vestments, and the liturgy throughout is of a penitential character. The saints judge nations, and rule over people: and the Lord their God shall reign forever. (Ps. 32: 1) Rejoice in the Lord, ye just: praise becometh the upright. v. Glory be to the Father and to the Son and to the Holy Ghost, as it was in the beginning, is now and ever shall be, world without end. Amen. O Lord, our God, multiply Thy graces upon us, and grant that joy may follow in the holy praise of those whose glorious festival we anticipate. Through our Lord Jesus Christ, Thy Son, Who liveth and reigneth with Thee in the unity of the Holy Ghost, one God Forever and ever. R.Amen. Let us pray. O Lord, our God, multiply Thy graces upon us, and grant that joy may follow in the holy praise of those whose glorious festival we anticipate. Let us pray. Defend us, we beseech Thee, O Lord, from all dangers of mind and body: and through the intercession of the blessed and glorious Mary, ever Virgin, mother of God, of St Joseph, of Thy holy apostles, Peter and Paul, and of all the saints, in Thy loving-kindness grant us safety and peace; that, all adversities and errors being overcome, Thy Church may serve Thee in security and freedom. Through our Lord Jesus Christ, Thy Son, Who liveth and reigneth with Thee in the unity of the Holy Ghost, God, Forever and ever. Lesson from the Book of The Apocalypse of Blessed John the Apostle. In those days, Behold, I, John, saw in the midst of the throne and of the four living creatures, and in the midst of the ancients, a Lamb, standing as it were slain, having seven horns and seven eyes, which are the seven spirits of God, sent forth into all the earth. And He came, and took the book out of the right hand of Him that sat on the throne: and when He had opened the book, the four living creatures, and the four and twenty ancients fell down before the Lamb, having every one of them harps, and golden vials full of odors, which are the prayers of saints; and they sung a new canticle, saying, Thou art worthy, O Lord, to take the book, and to open the seals thereof; because Thou wert slain, and hast redeemed us to God, in Thy blood, out of every tribe, and tongue, and people, and nation, and hast made us to God a kingdom and priests; and we shall reign on the earth. And I beheld, and I heard the voice of many angels round about the throne, and the living creatures and the ancients, and the number of them was thousands of thousands, saying with a loud voice, The Lamb that was slain is worthy to receive power, and divinity, and wisdom, and strength, and honor, and glory, and benediction for ever and ever. Amen. The saints shall rejoice in glory; they shall be joyful in their beds. 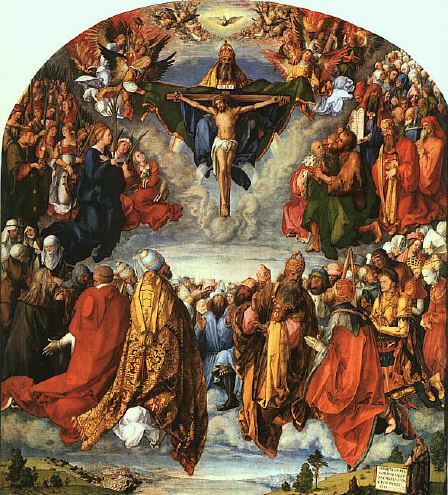 V. Sing ye to the Lord a new canticle; let His praise be in the assembly of the saints. The saints shall rejoice in glory, they shall be joyful in their beds; the high praises of God shall be in their mouths. We heap Thine altar with oblations. O Lord; grant, we beseech Thee, that they may profit for our salvation by the prayer of all Thy saints, to whose coming festival we hasten. Through our Lord Jesus Christ Thy Son our Lord, Who liveth and reigneth with Thee in the unity of the Holy Ghost, one God Forever and ever. R. Amen. Sanctify, we beseech Thee, 0 Lord, the gifts we offer, and cleanse our hearts by the light of the Holy Ghost. Graciously hear us, O God our Saviour, and, by virtue of this Sacrament, defend us from all enemies of soul and body, bestowing upon us Thy grace here and Thy glory hereafter. Through our Lord Jesus Christ, Thy Son, Who liveth and reigneth with Thee in the unity of the Holy Ghost, God, Forever and ever. R. Amen. The souls of the just are in the hand of God, and the torment of malice shall not touch them: in the sight of the unwise they seemed to die, but they are in peace. Having completed the sacraments and the joys of the earnestly desired festival, O Lord, we beseech Thee that we may be assisted by the prayers of those in whose loving remembrance they are offered. Through the Lord Jesus Christ, Thy Son, Who liveth and reigneth with Thee in the unity of the Holy Ghost, one God For ever and ever. R. Amen. Let us pray. May our hearts be cleansed, 0 Lord, by the inpouring of the Holy Spirit; may He render them fruitful by watering them with His Heavenly dew. Forever and ever. R. Amen.